Offering an on-the-go dessert option that, apparently, you can eat in a car, Starbucks Korea recently launched push-up cake pops that they're calling "Drive-Thru Cakes." The cakes are only available at Starbucks drive-thru locations in South Korea and come in three varieties: Red Velvet, Lemon Yellow Cake, and Moist Chocolate. 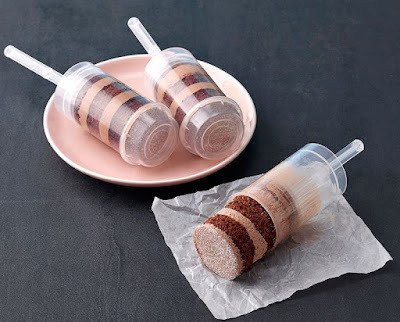 Like a Push-Up Pop, there's a stick that you push up into one end of a cylinder to raise the three-layered cakes out of the other end. Compared to the cake pops that Starbucks offers here in the US, the Drive-Thru Cakes seem to offer a bit more cake with a slight less risk of frosting cracking onto your lap.